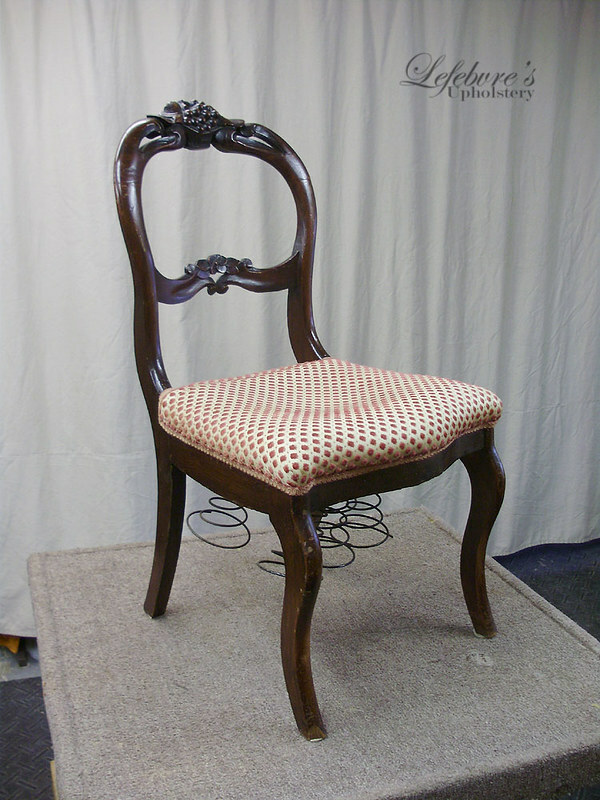 This is a typical antique or vintage chair. 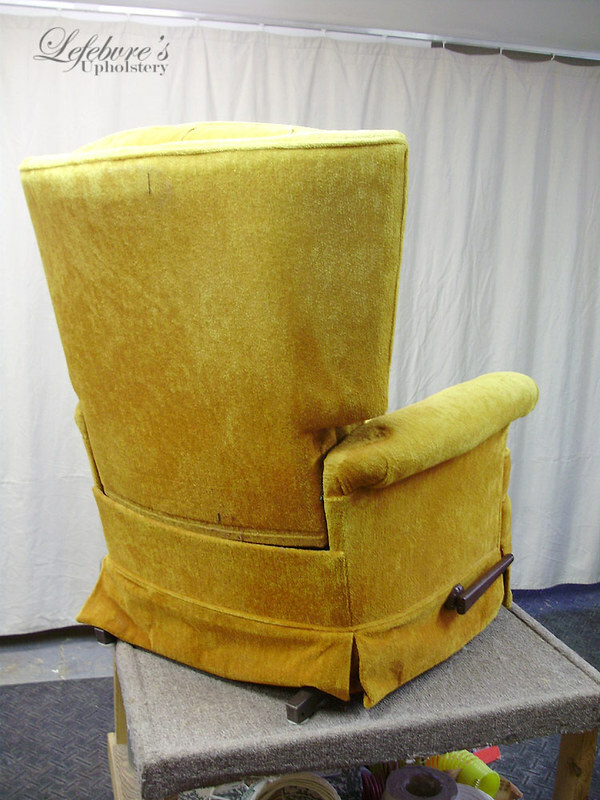 Hard to say exactly how old, but at least 1960s or earlier. 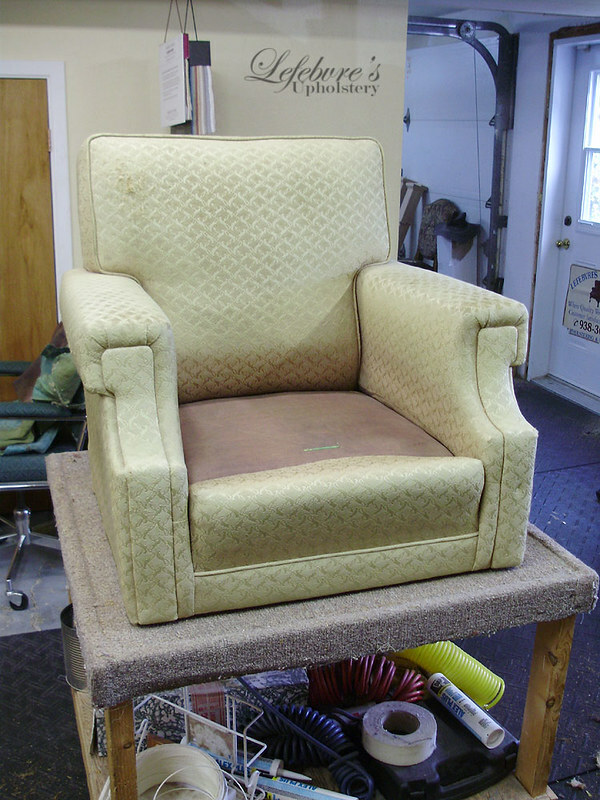 Chair after. 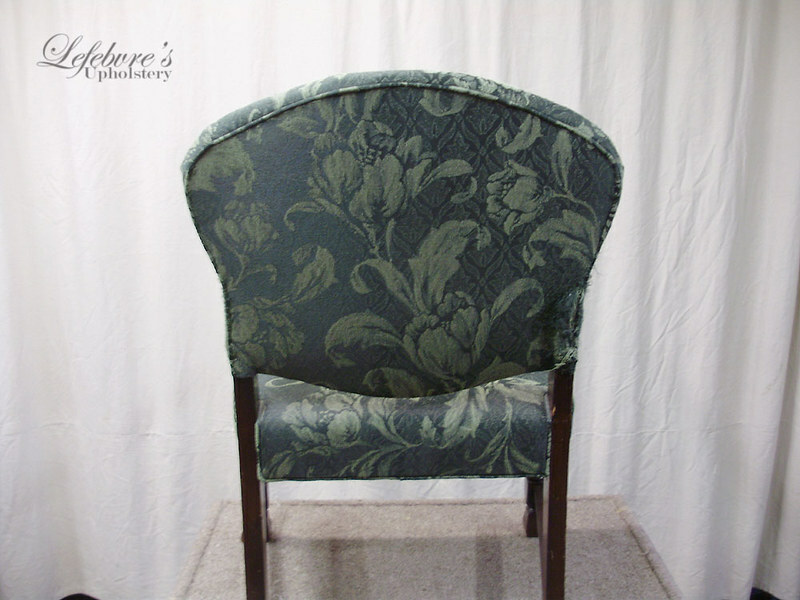 The fabric has a very light leaf pattern in a tone-on-tone off white. 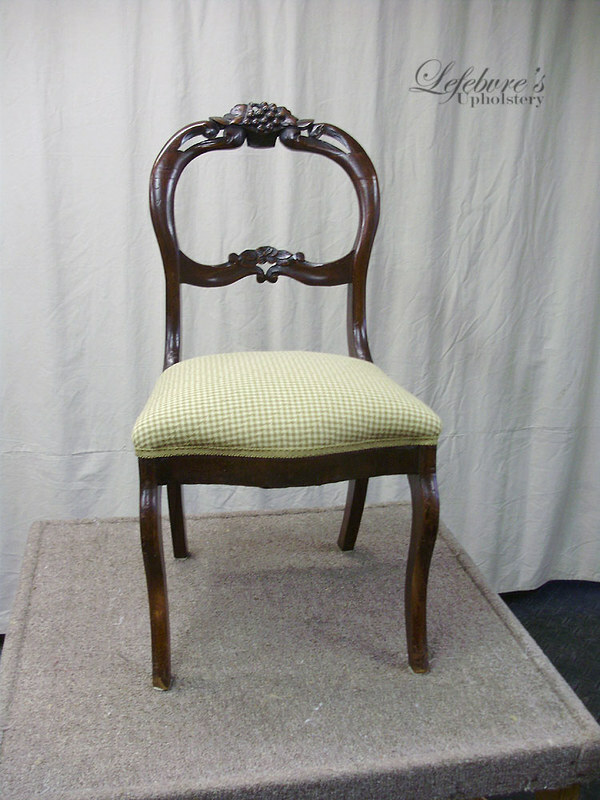 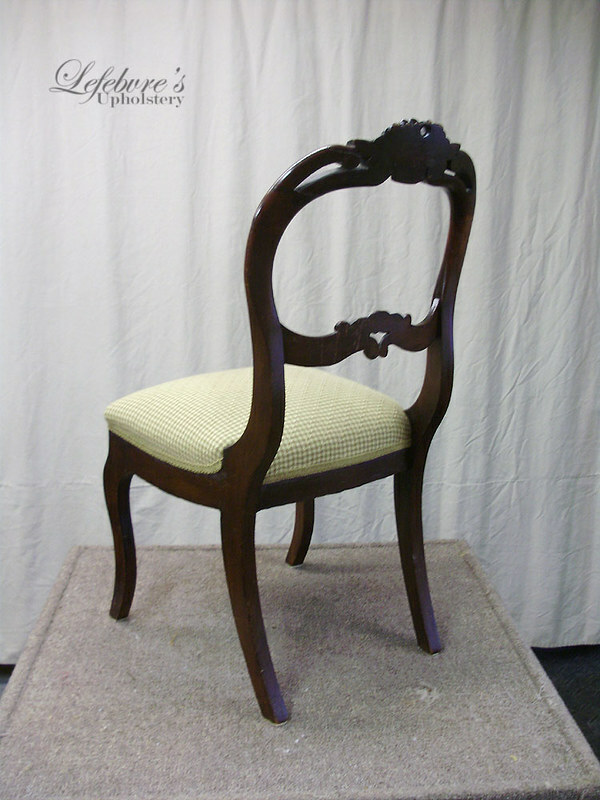 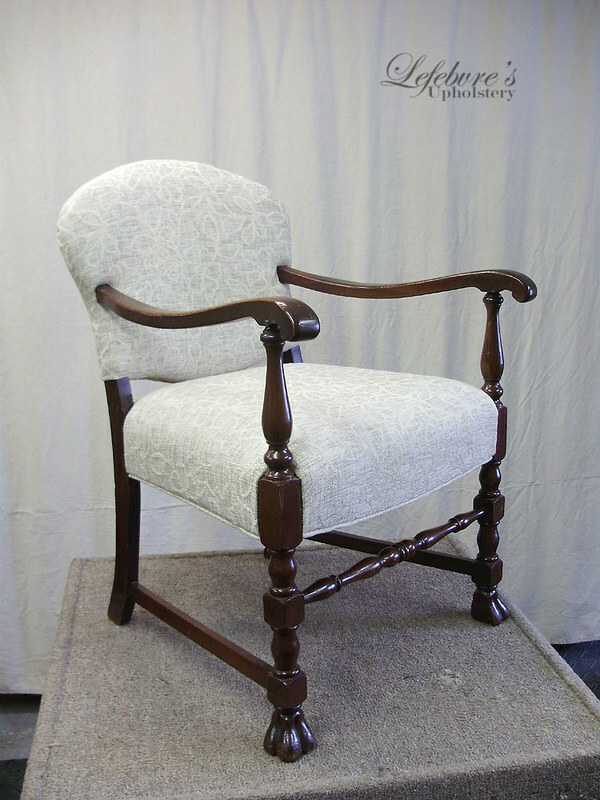 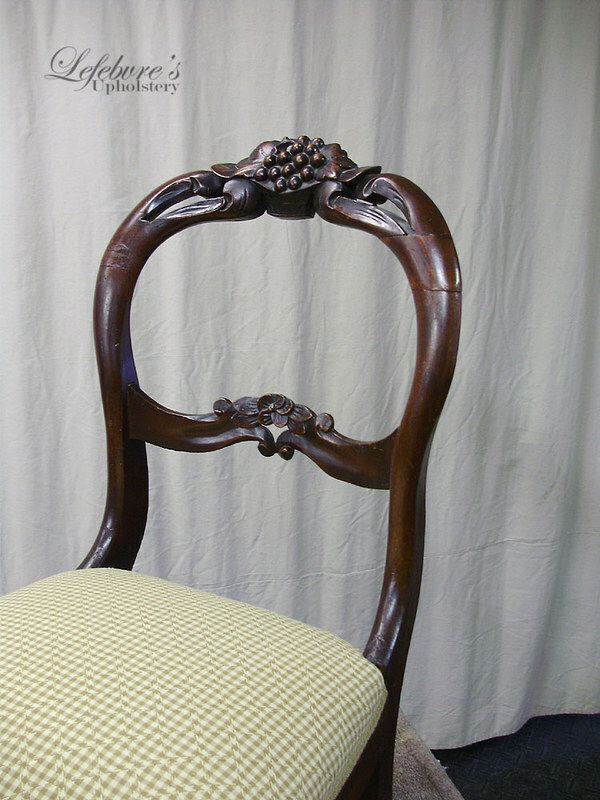 A very typical and beautifully carved Walnut chair. 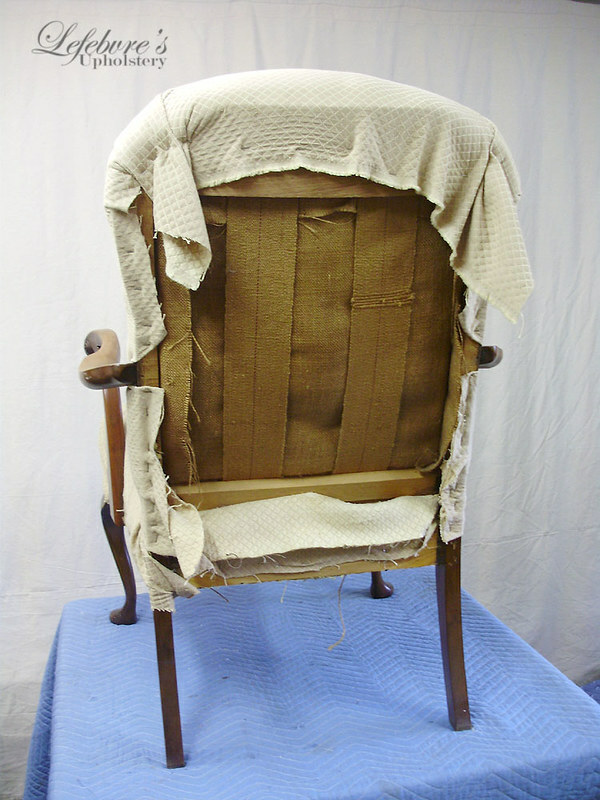 The seat had collapsed, and the fabric was changed. 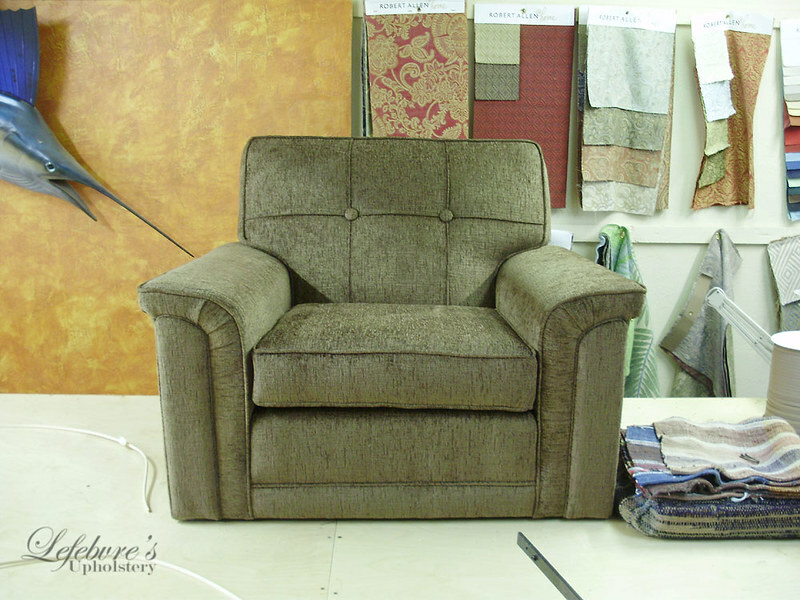 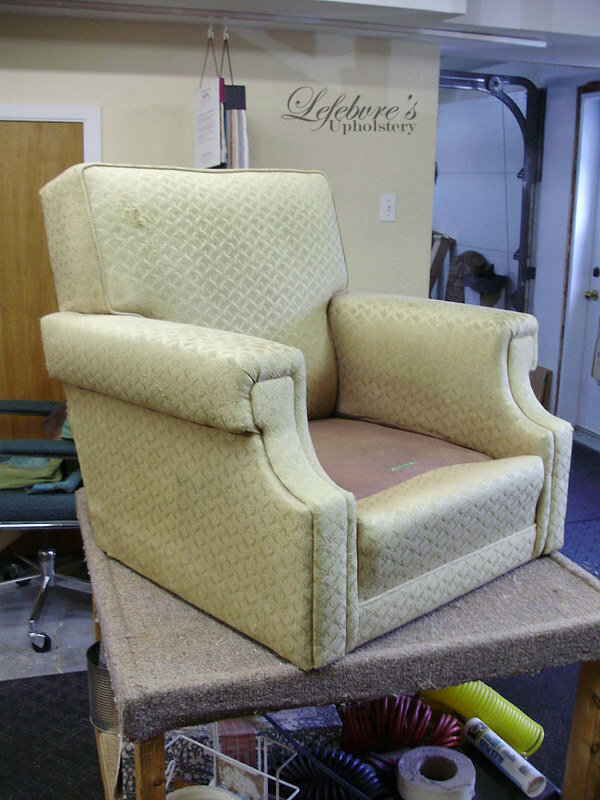 Here is a typical La-Z-Boy recliner. 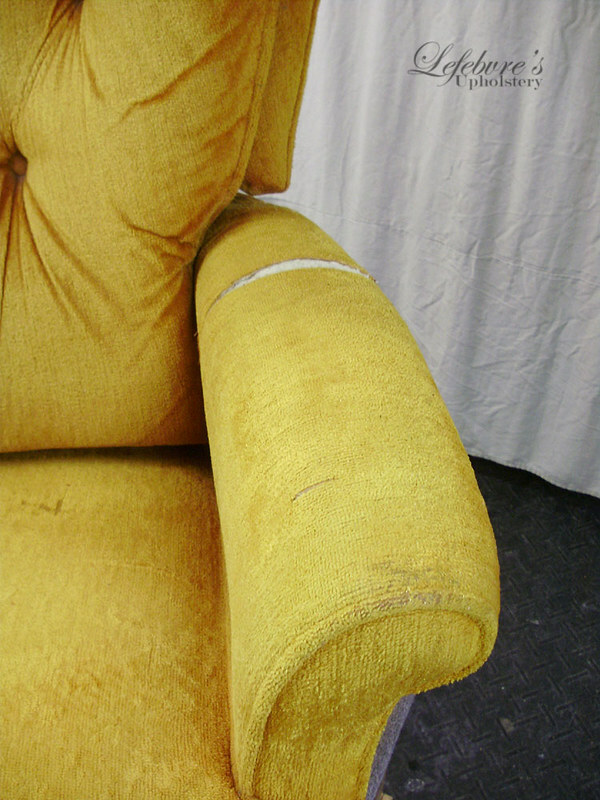 From yellow to navy blue. 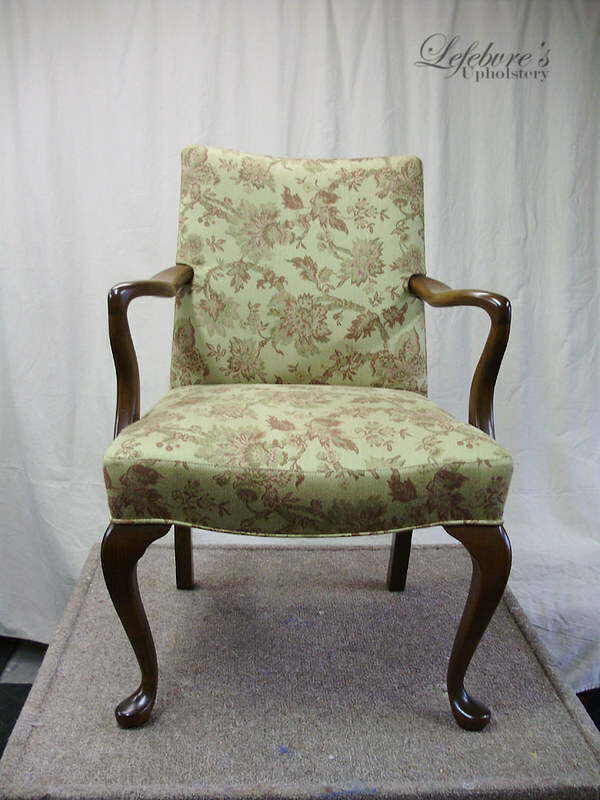 This is a lovely 3 piece set that is likely from the 1950s or 60s. 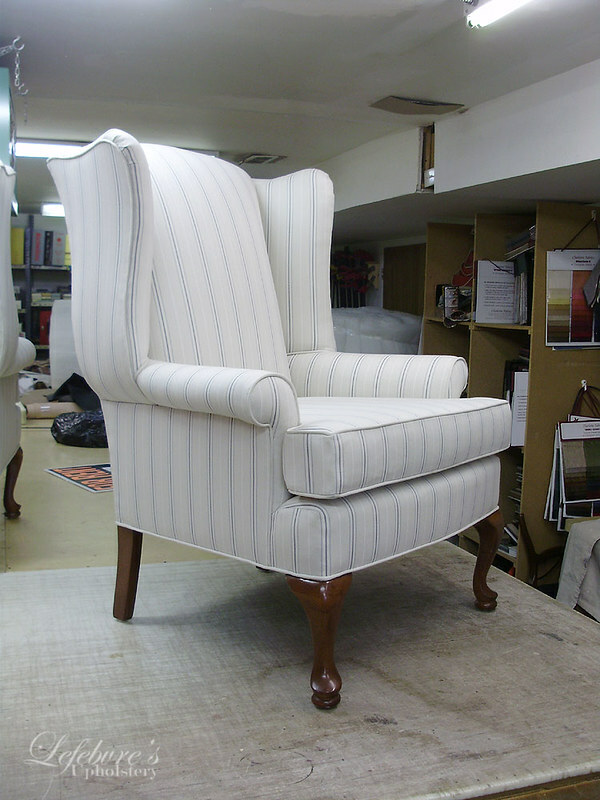 It is a nice simple style. 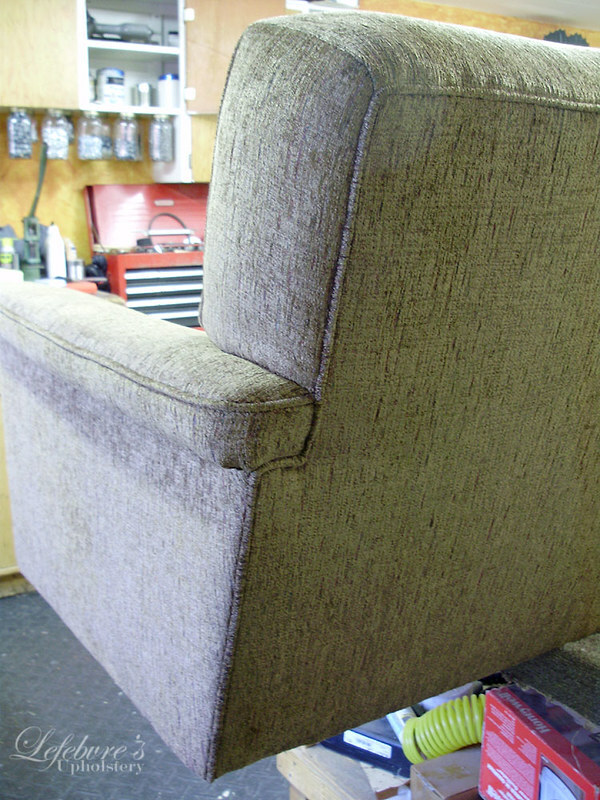 It needed a bit of attention. 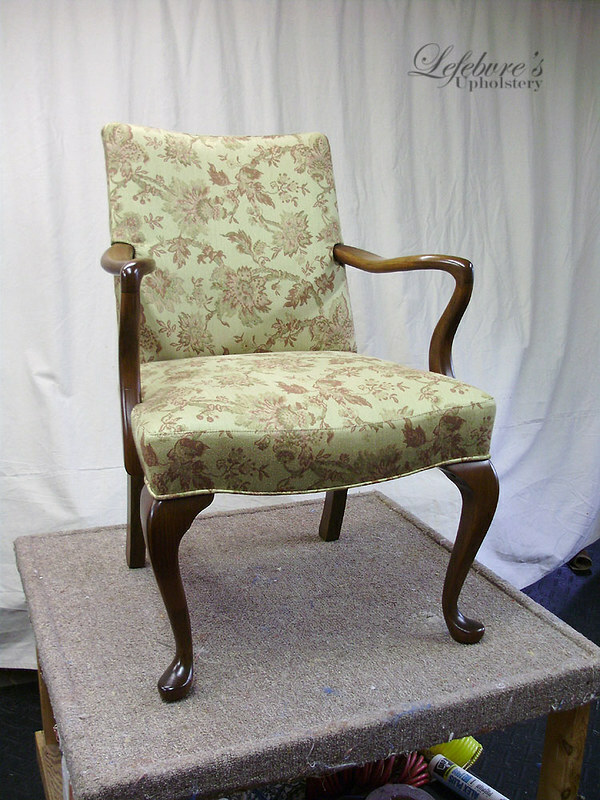 The set has 2 arm chairs. 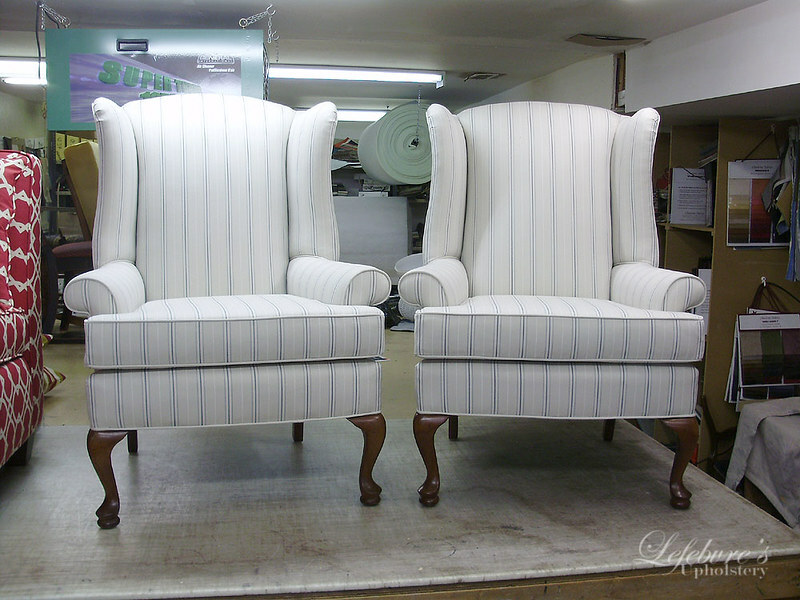 One with sloped (curved) arms, and one that matches the sofa. 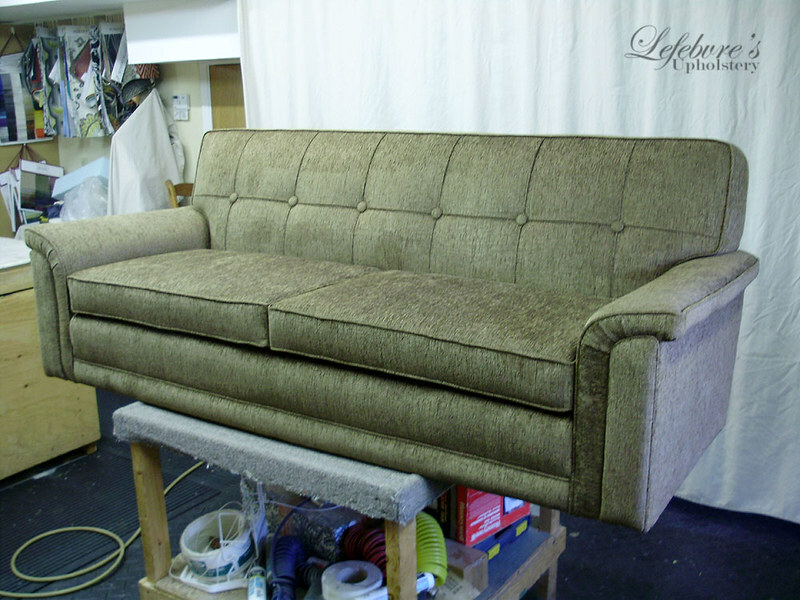 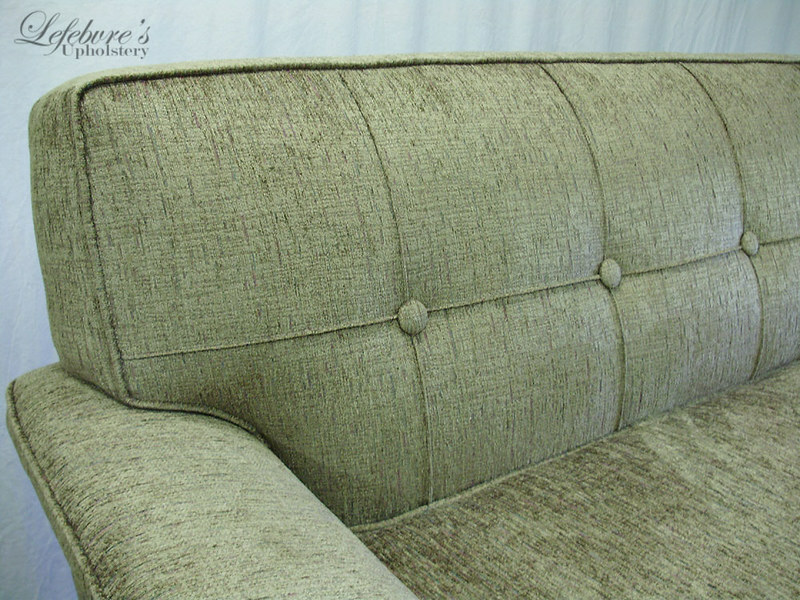 The chair and sofa were upholstered in a textures olive green, which went well with the client's home. 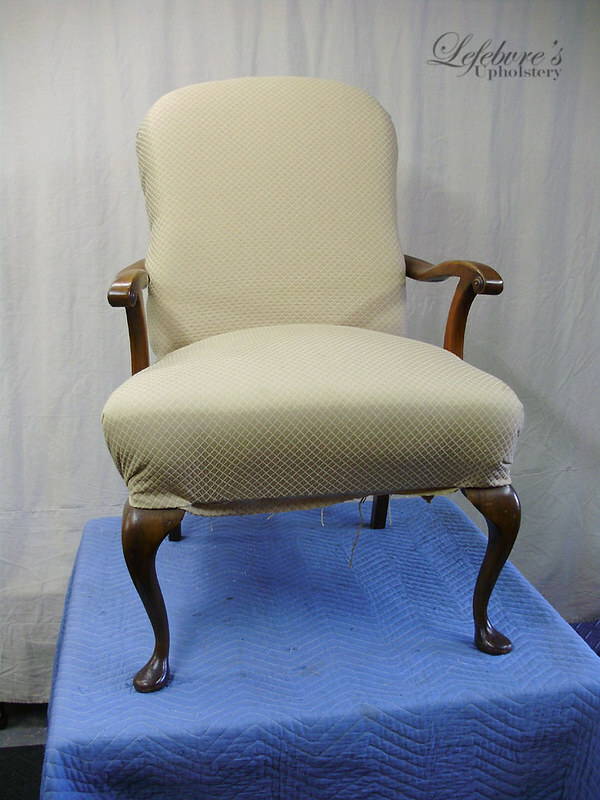 The colour is off in this photo. 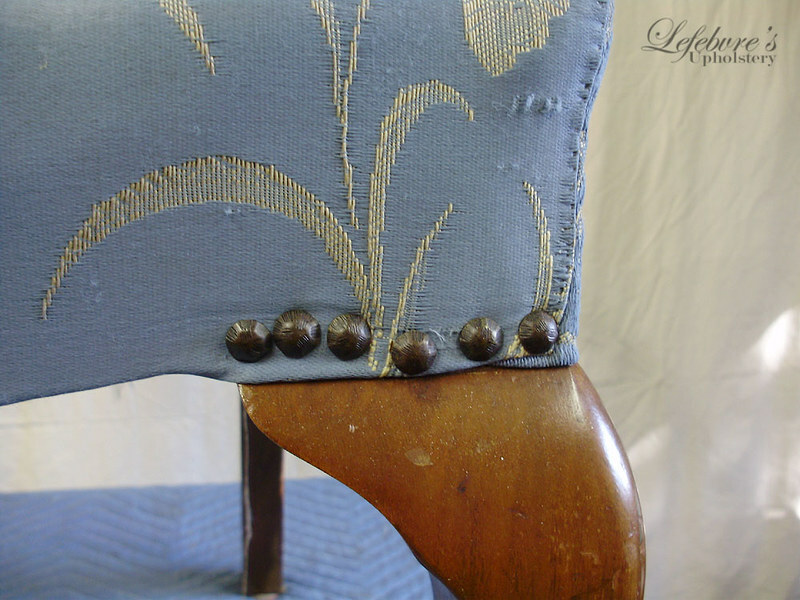 A detail from the sofa back. 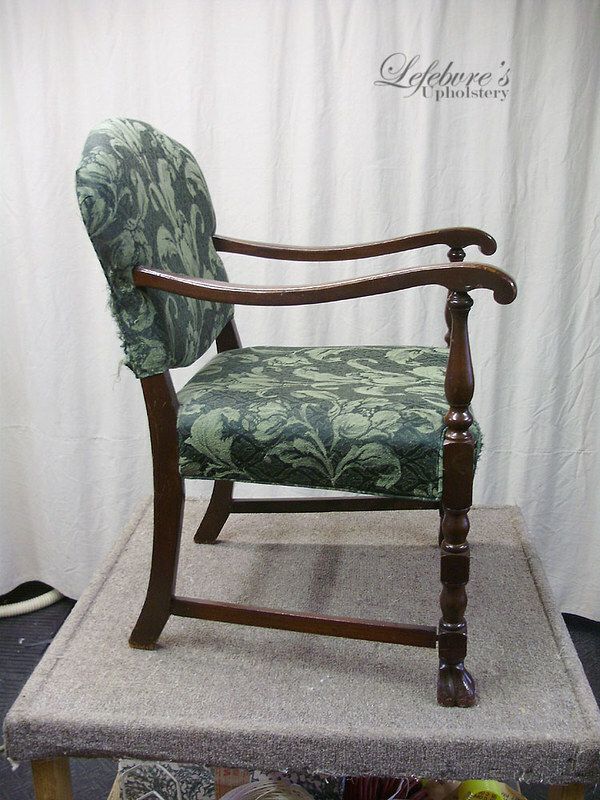 Unfortunately I did not get any photos of the other arm chair. 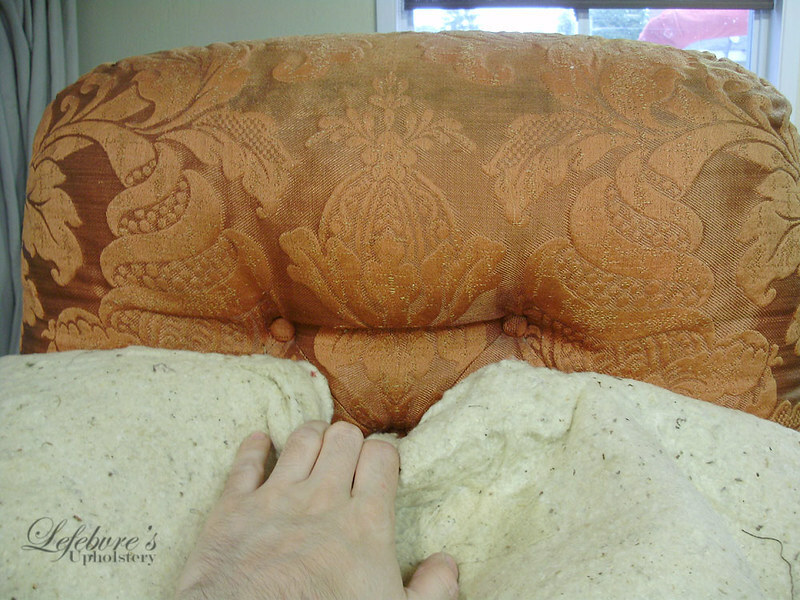 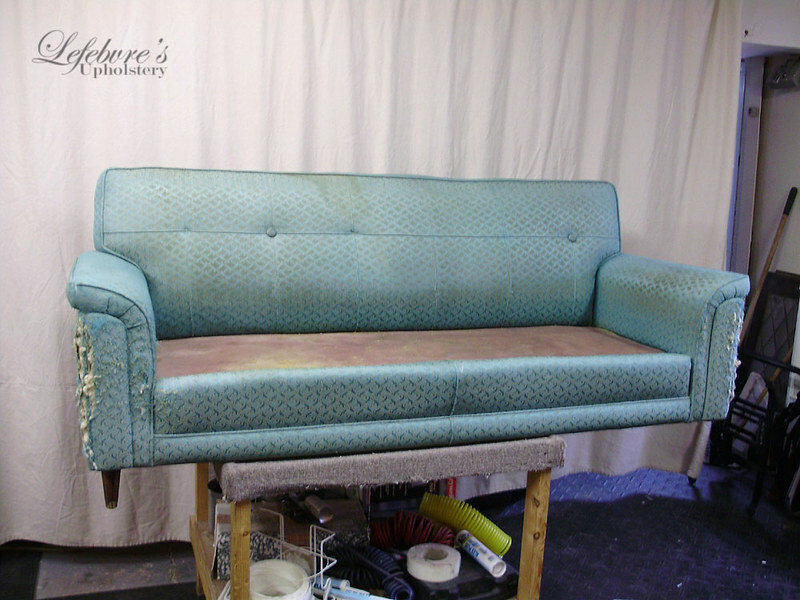 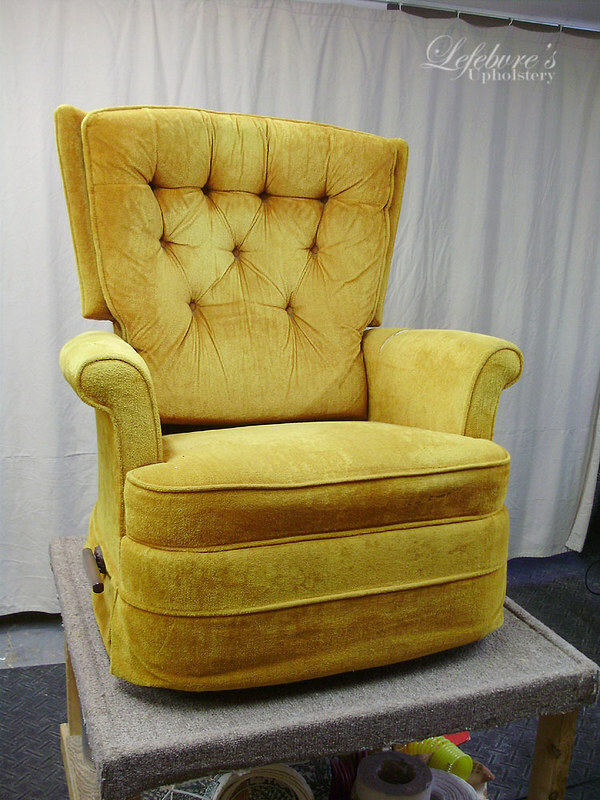 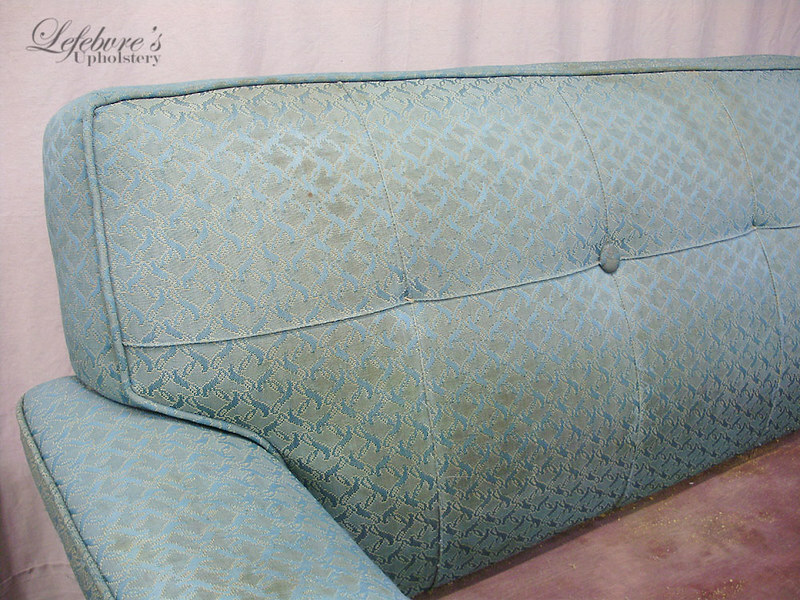 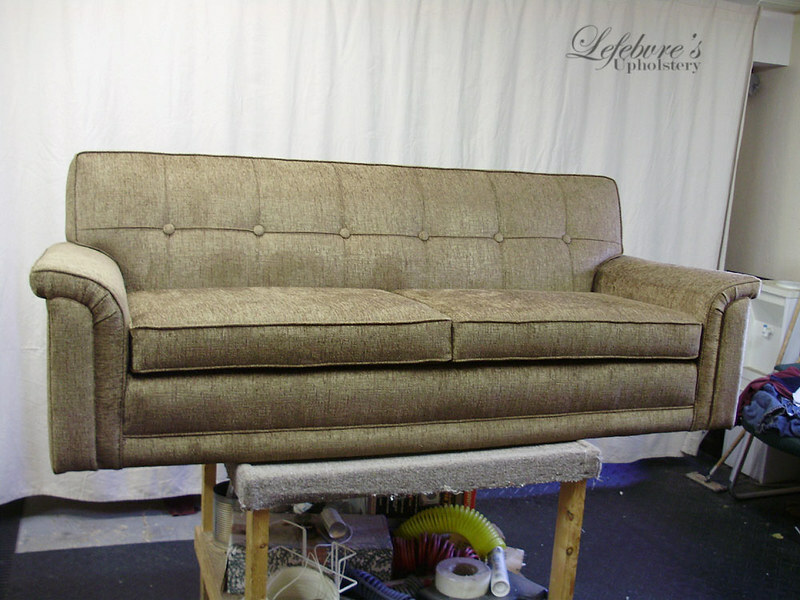 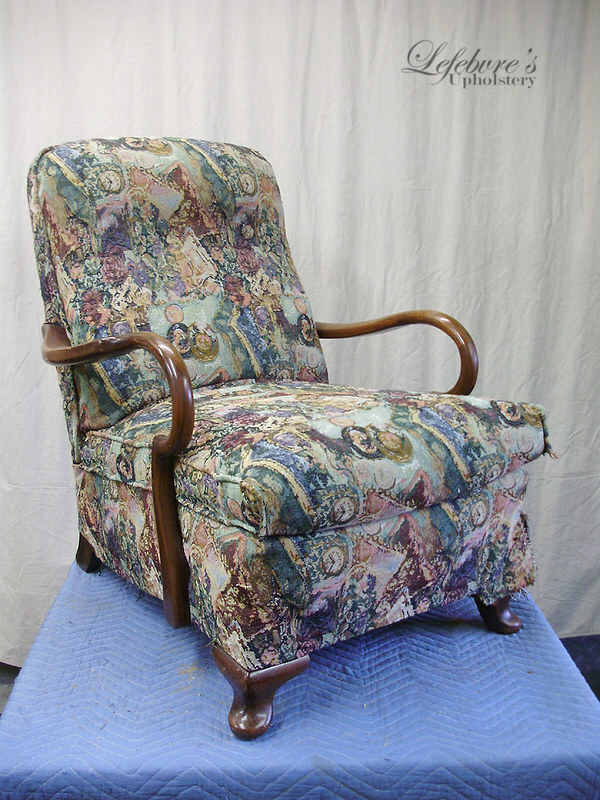 It was upholstered in a nearly identical fabric with a slightly different shade (a bit more brownish IIRC). 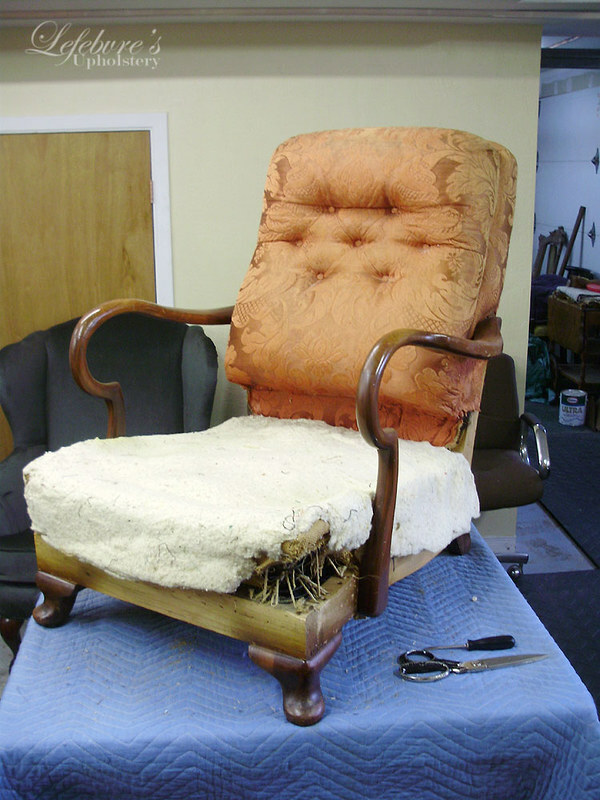 I have no "before" photos for this chair. 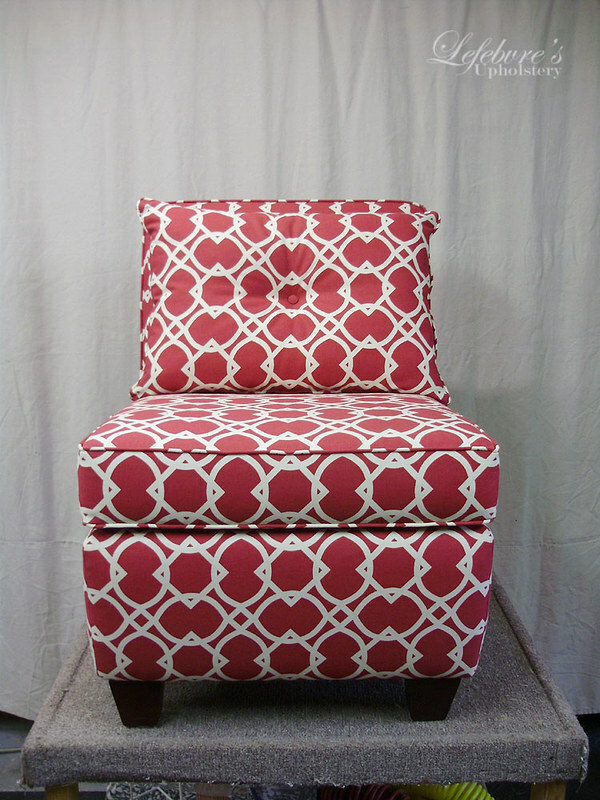 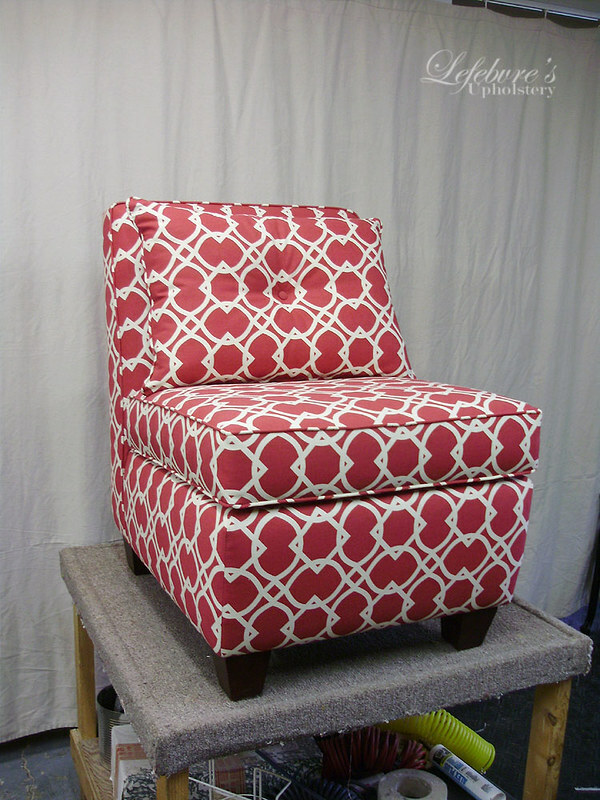 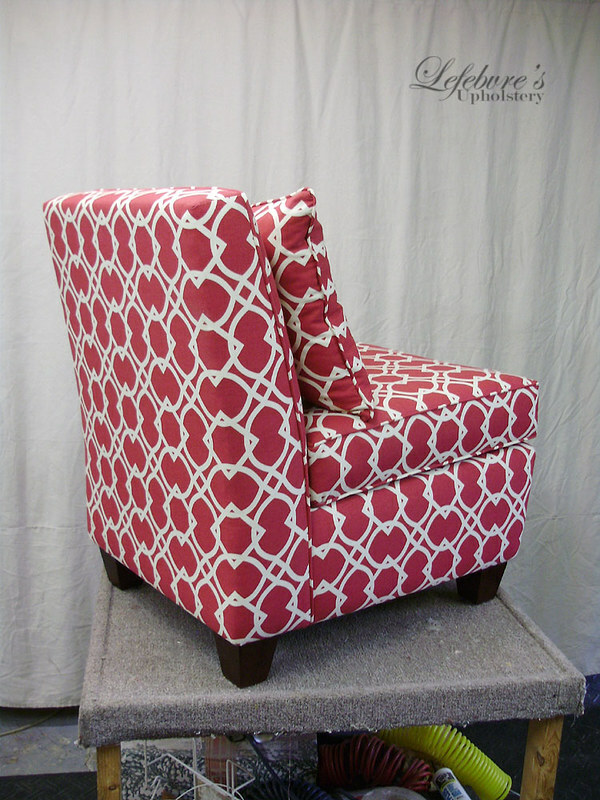 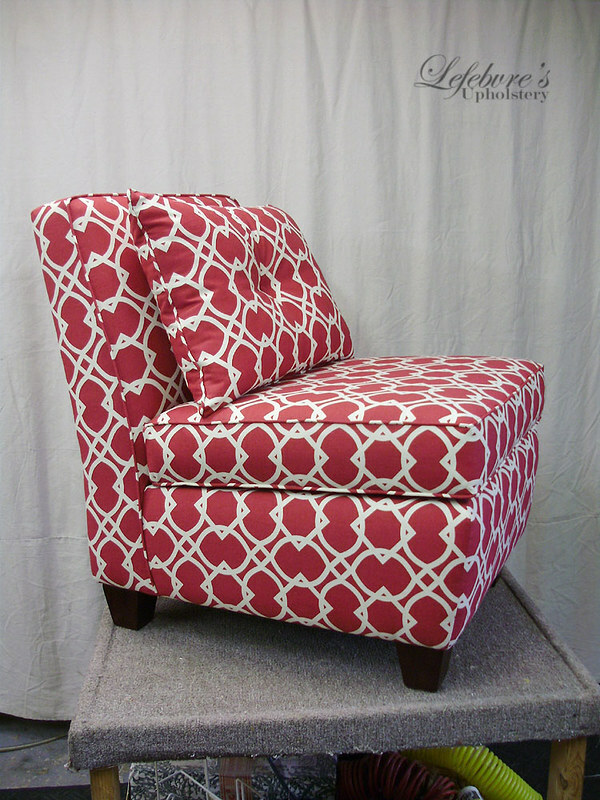 This is the completed chair, in a bold red geometric print. 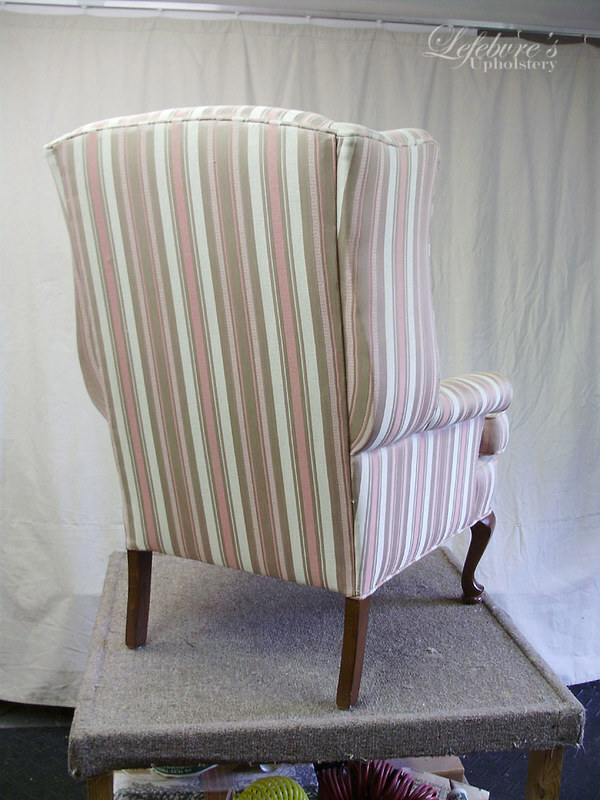 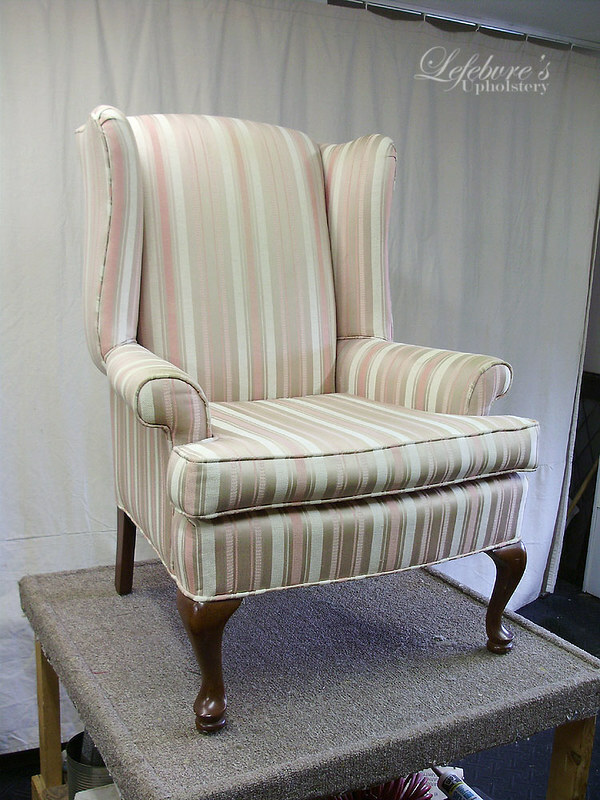 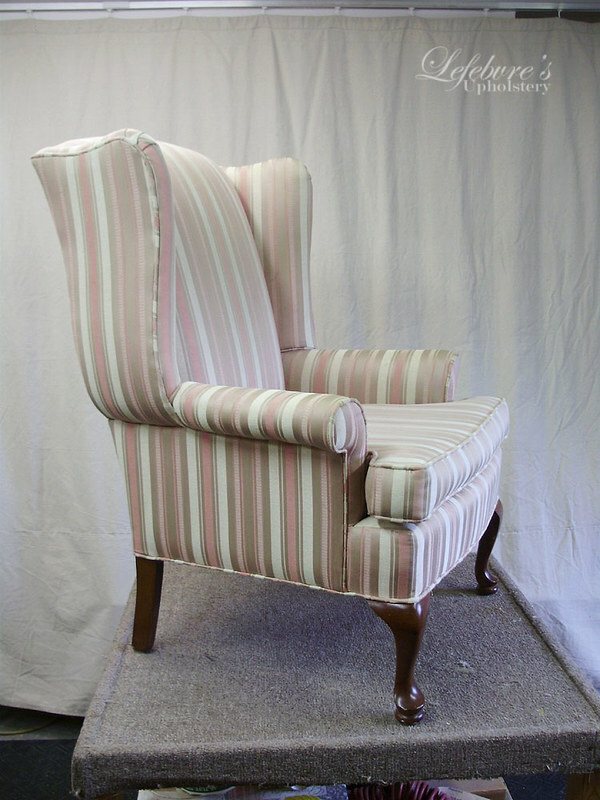 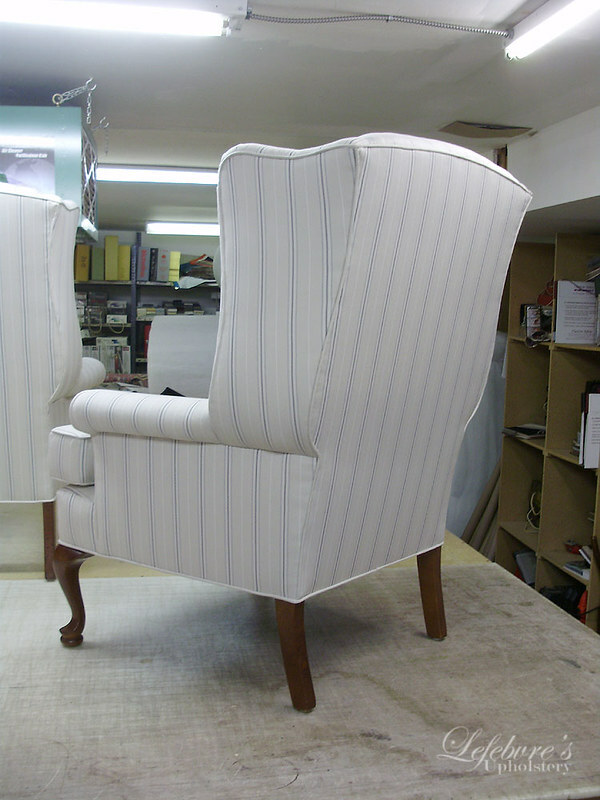 Here we have a pair of high quality Centrac wing chairs, redone in a lovely white fabric with light blue stripes. 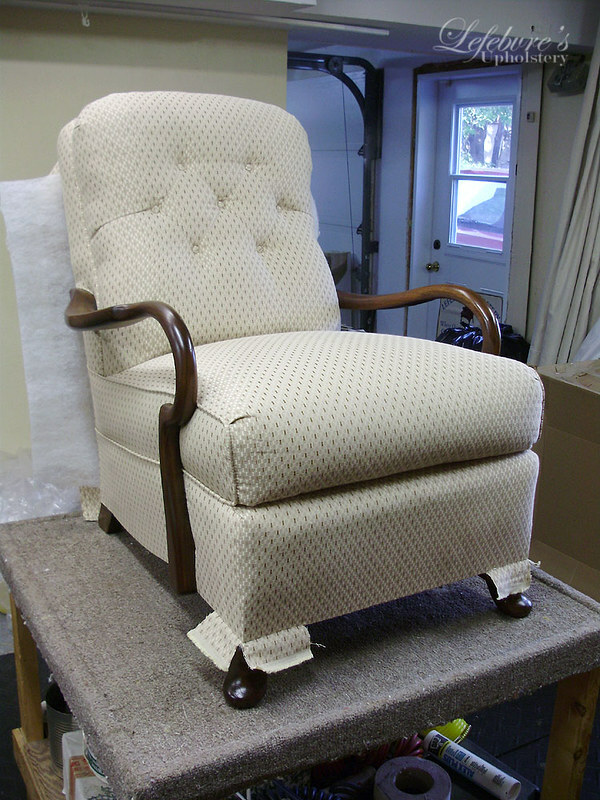 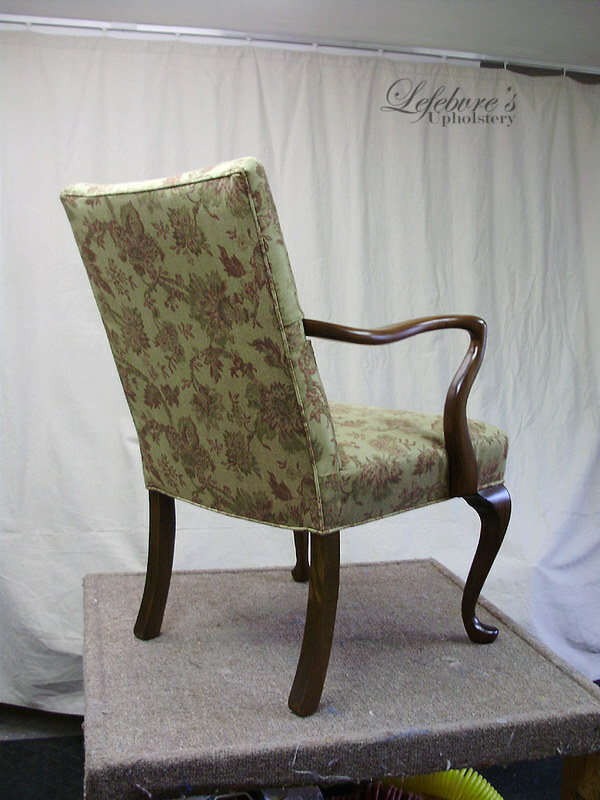 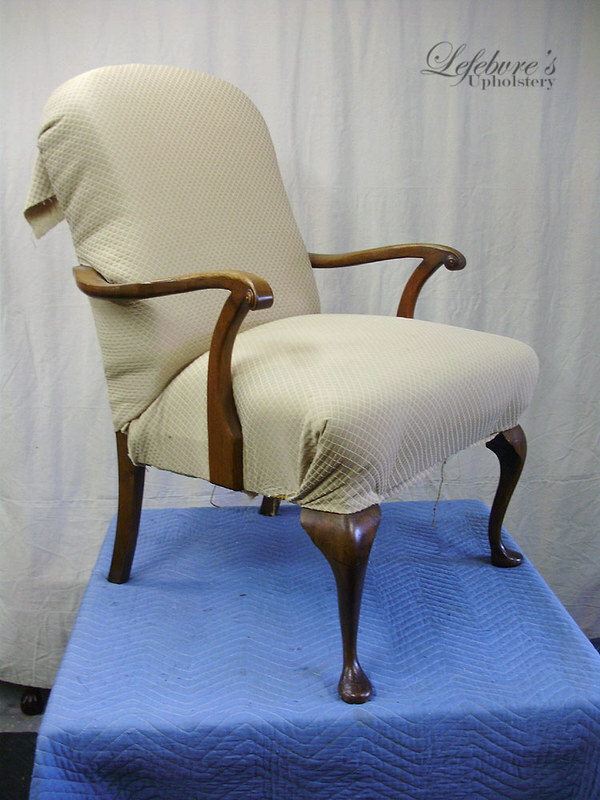 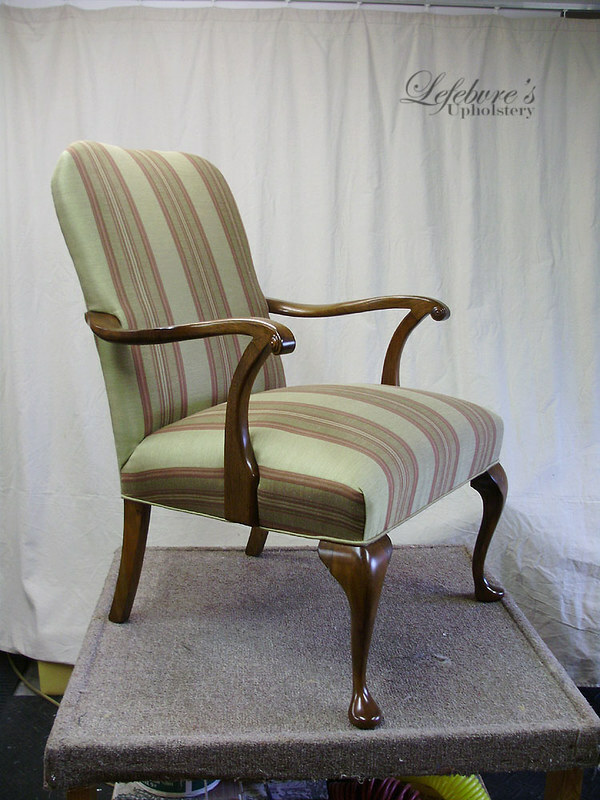 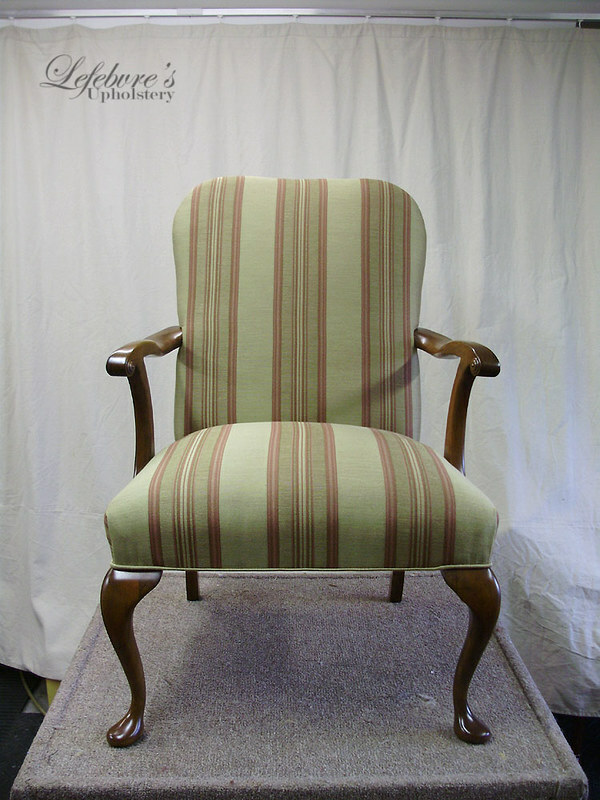 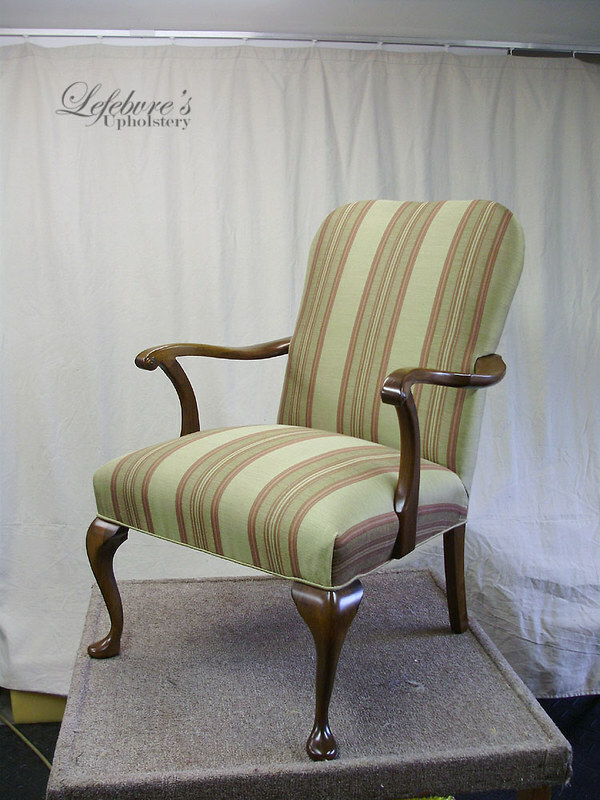 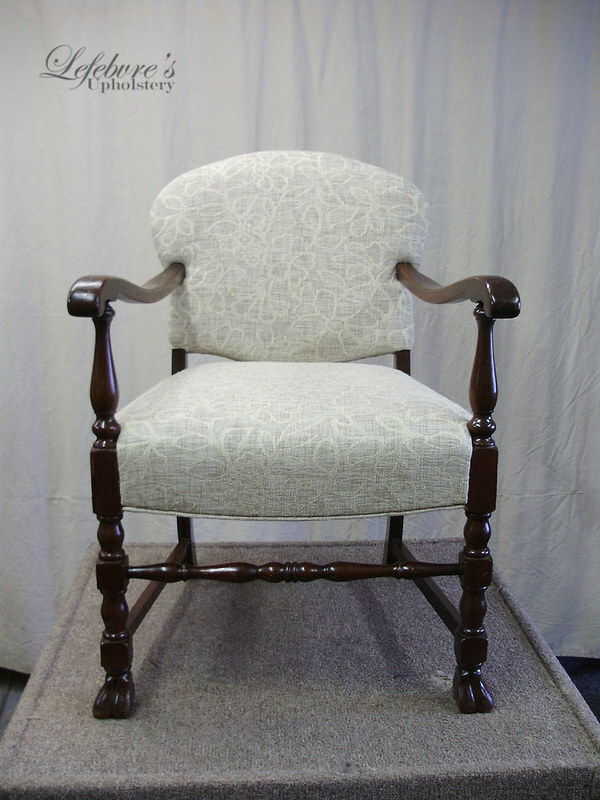 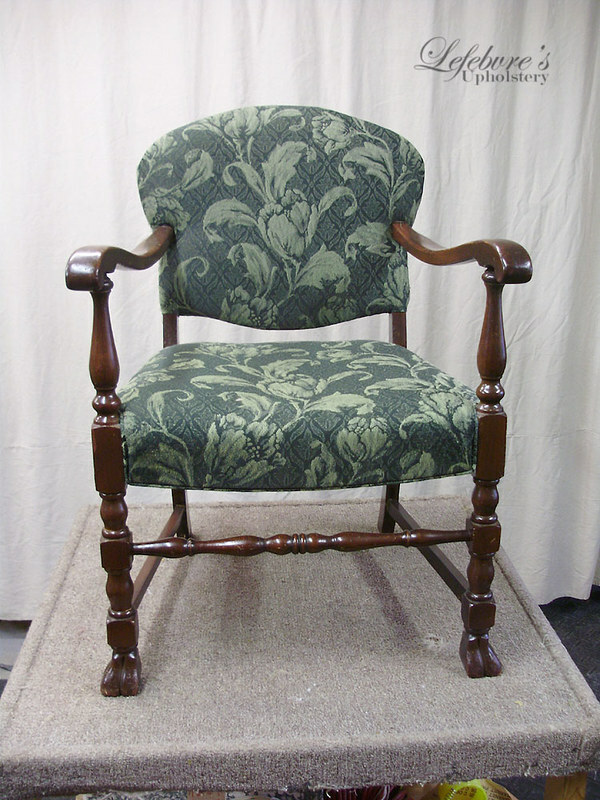 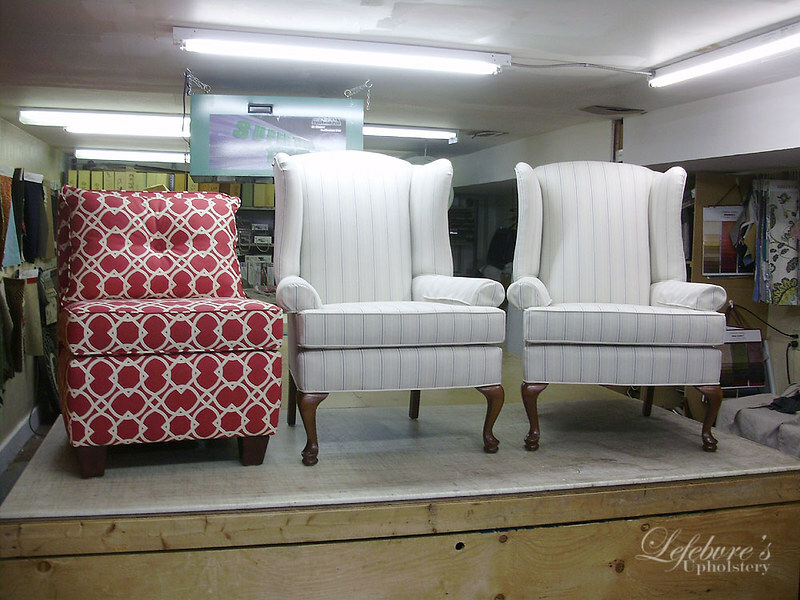 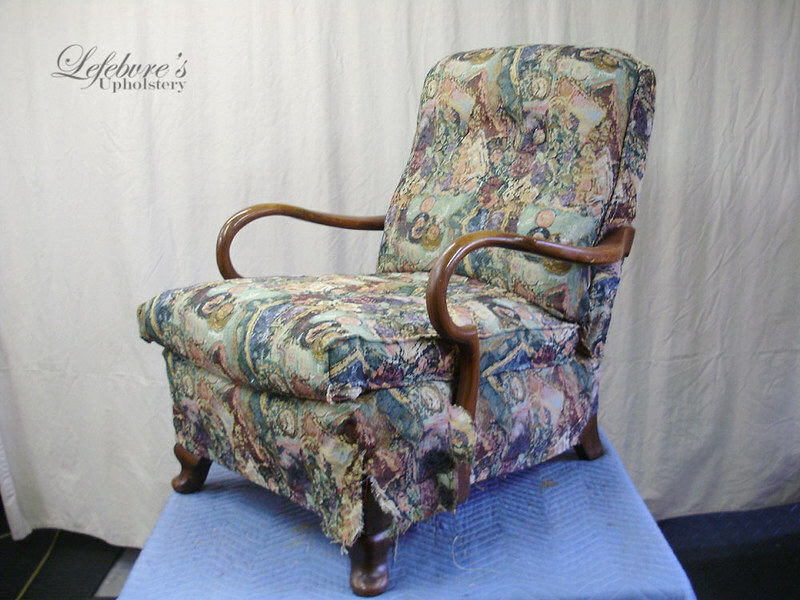 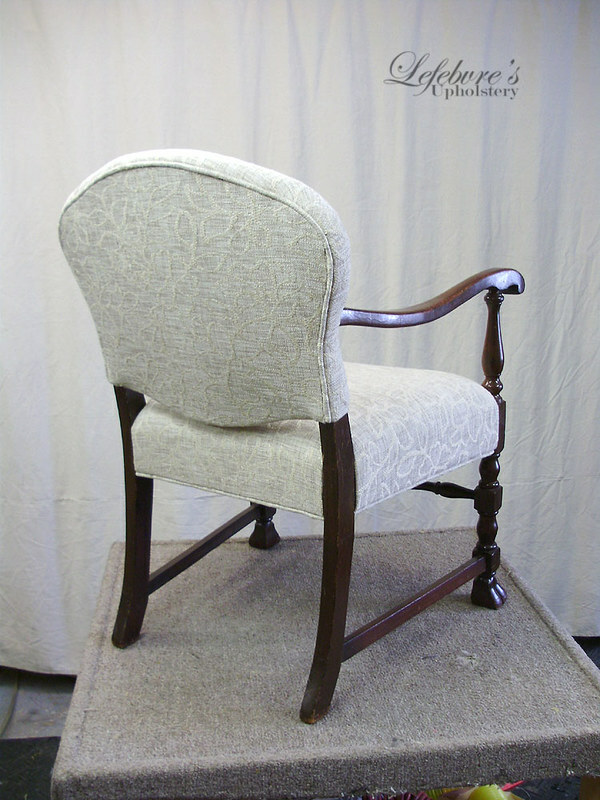 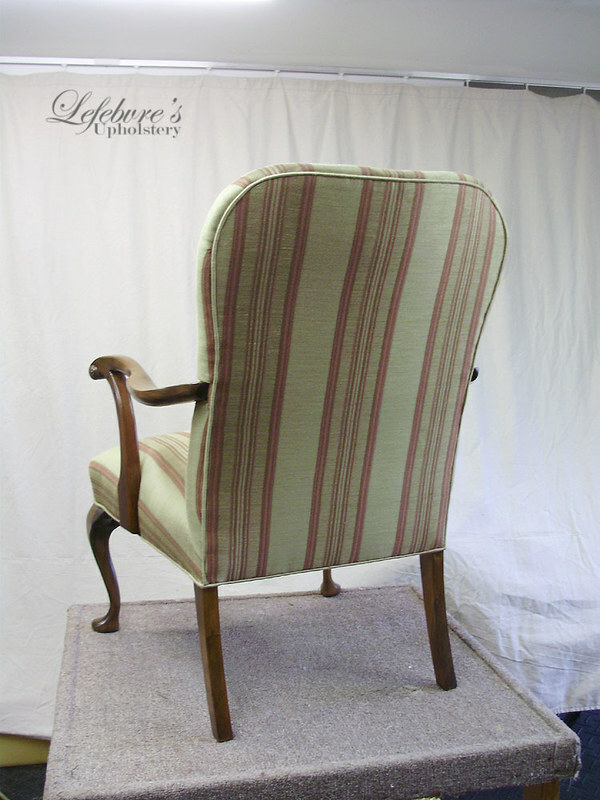 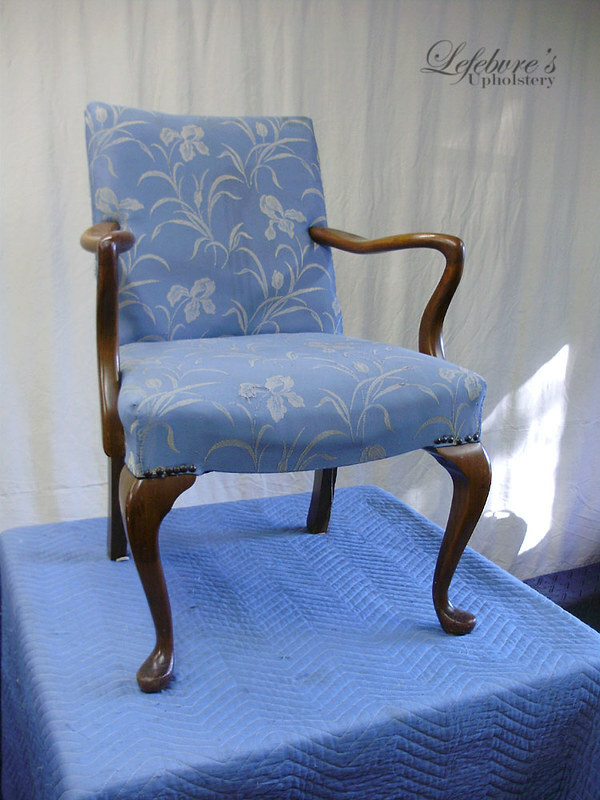 Three very different chairs were brought in from a client to be repaired and reupholstered. 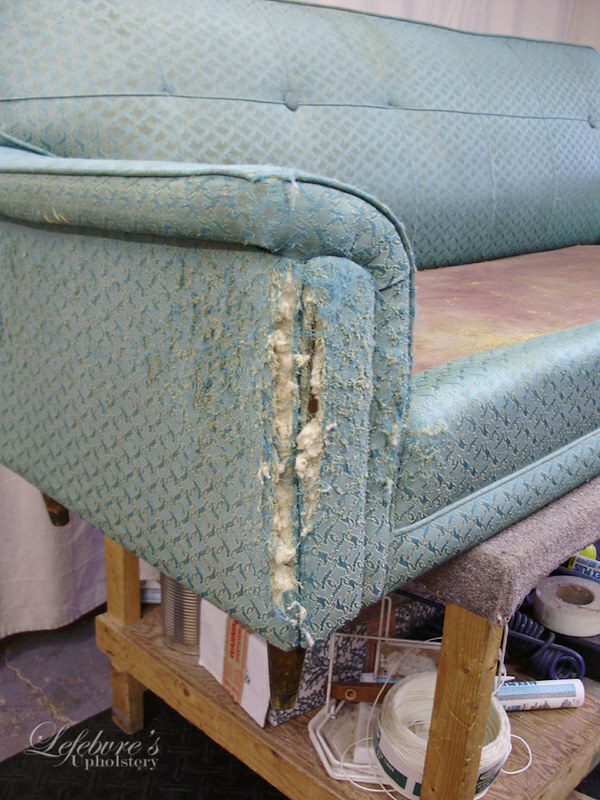 All were in various states of disrepair. 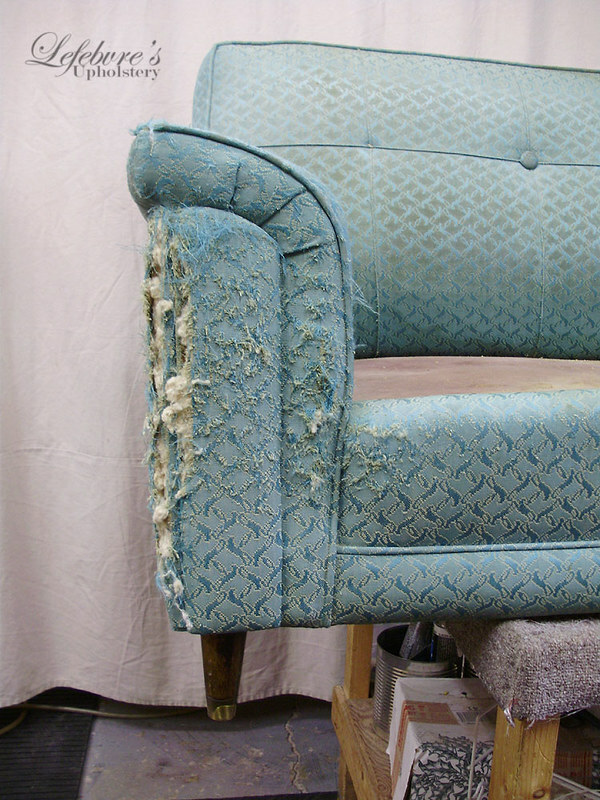 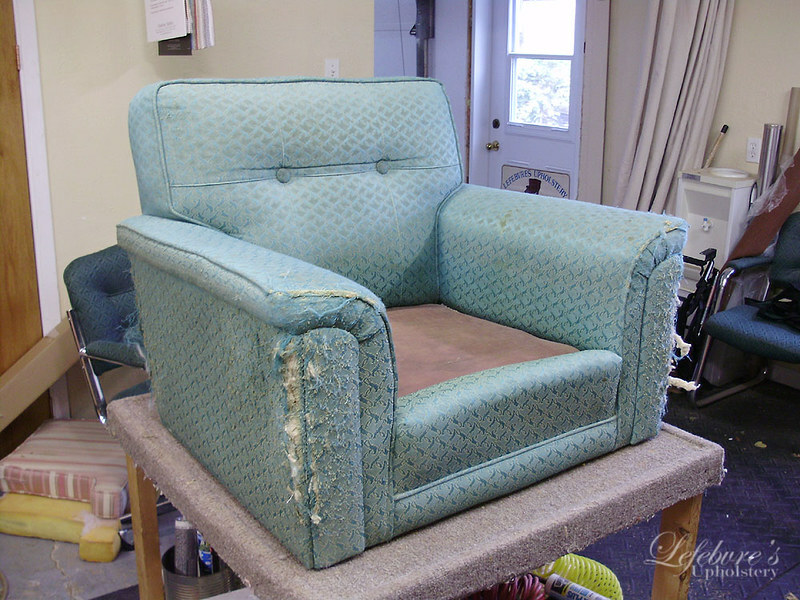 This first chair appears to have been an attempted DIY project that never got finished. 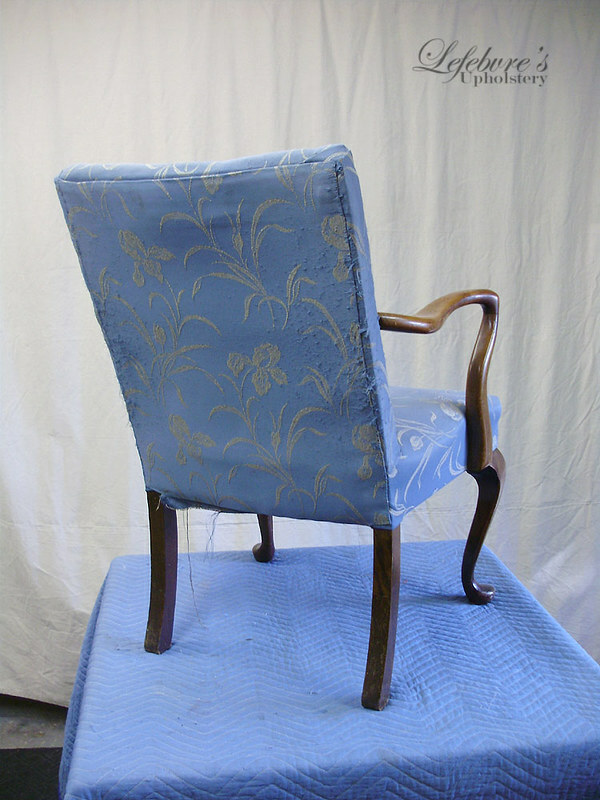 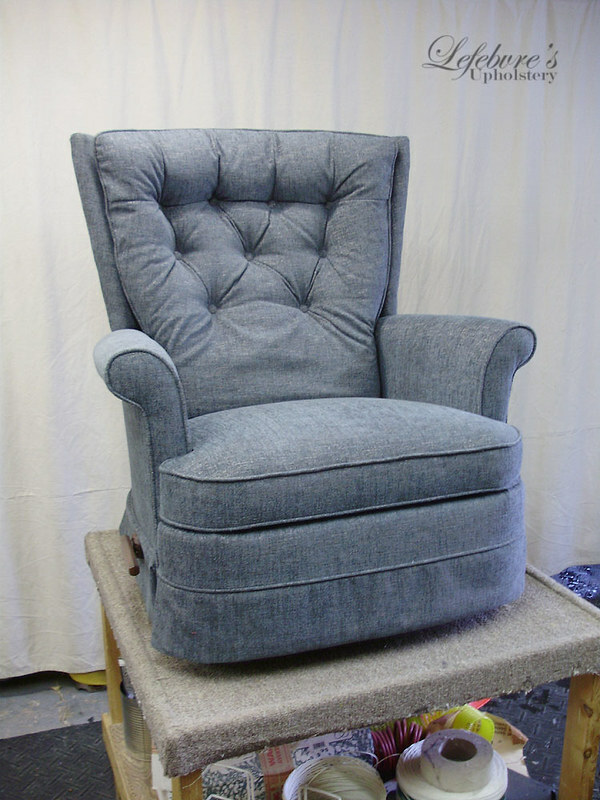 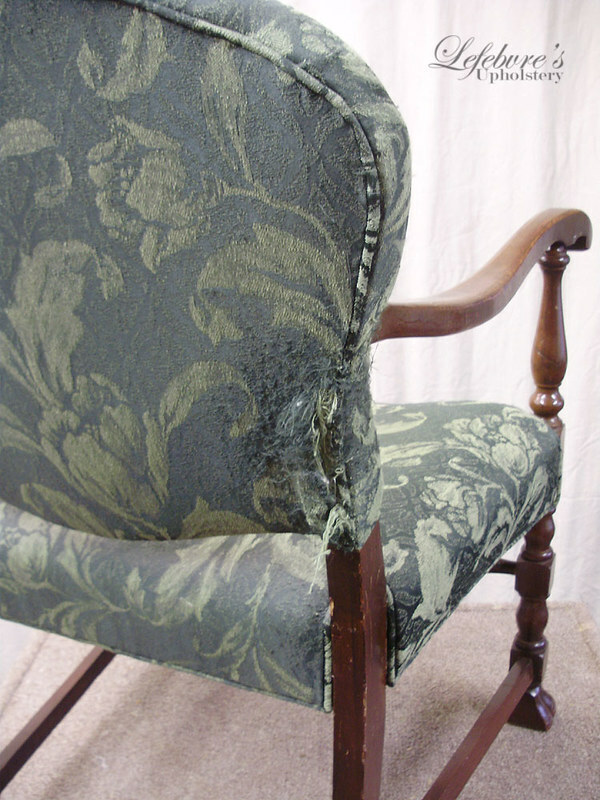 The second chair was not in too bad a shape, but the fabric was worn through. 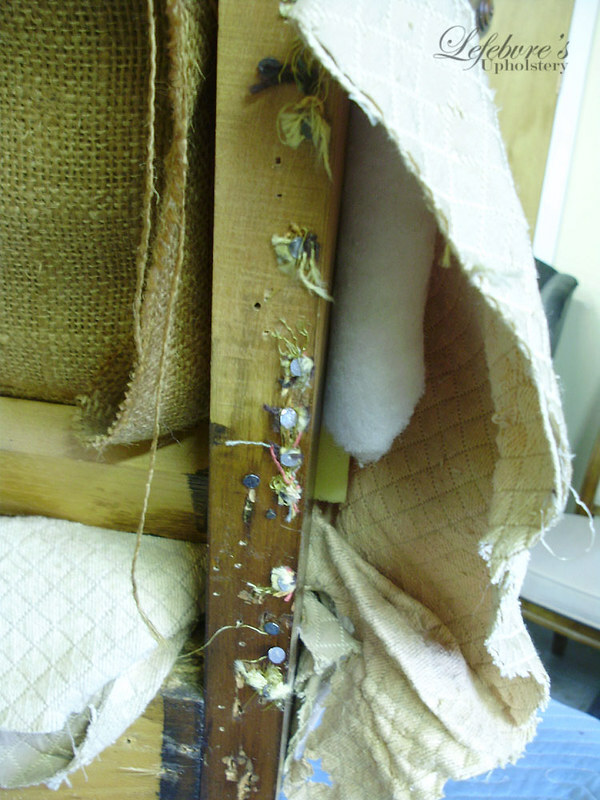 We found a previous cover underneath. 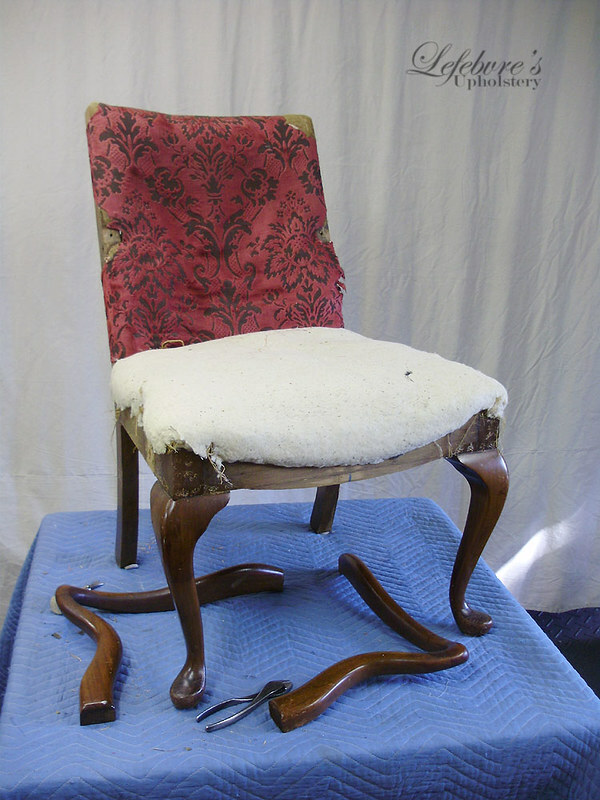 The arms also had to be repaired. 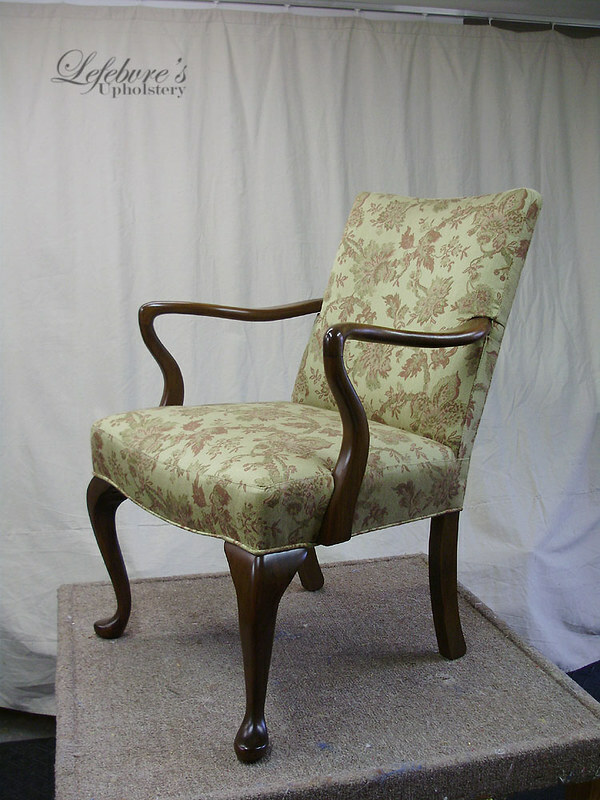 The third chair was a lovely 1930s arm chair with beautifully shaped arms. 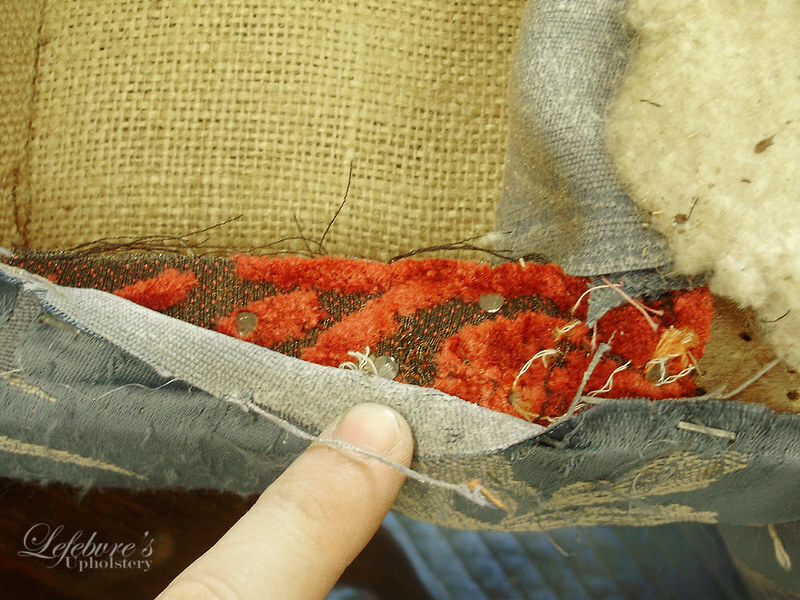 We also found a previous cover under this upholstery. 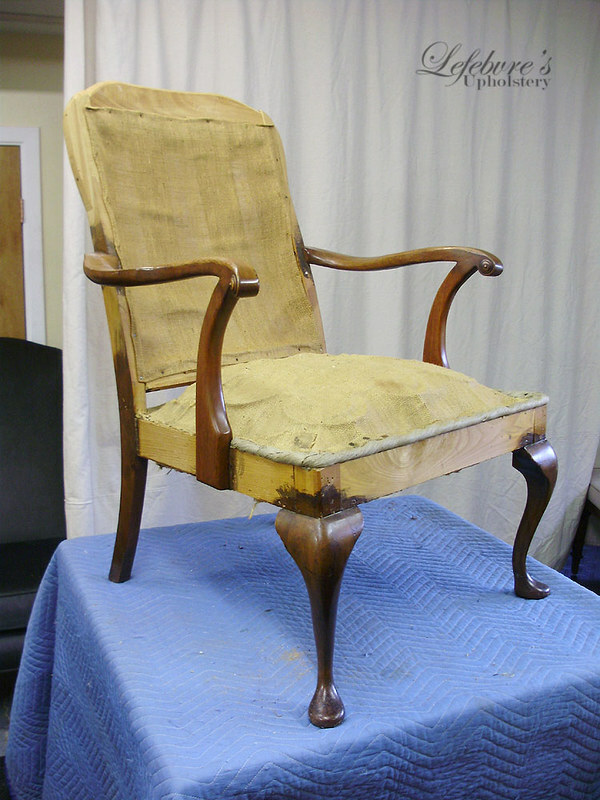 Unfortunately I never got a photo of the finished chair. 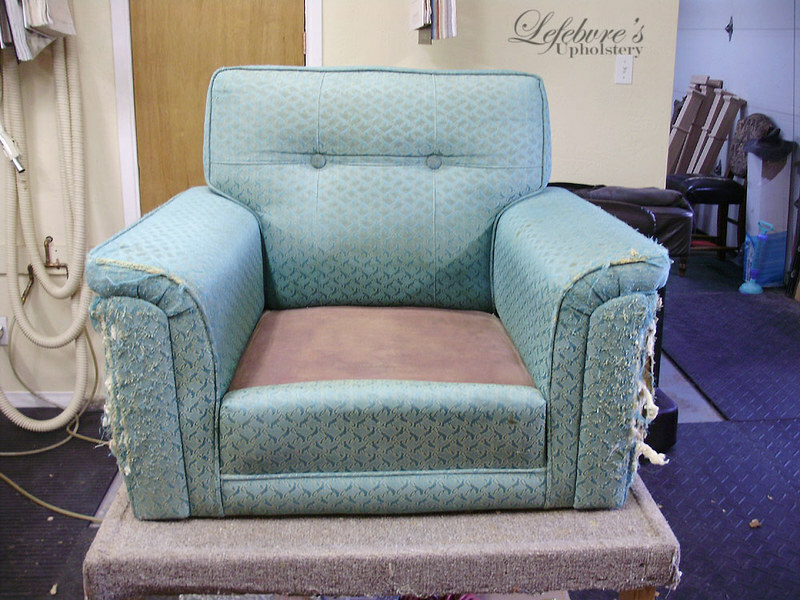 I only have this one photo of the chair about 95% done (the fabric around the feet hasn't been trimmed, and the piping hasn't been added yet. 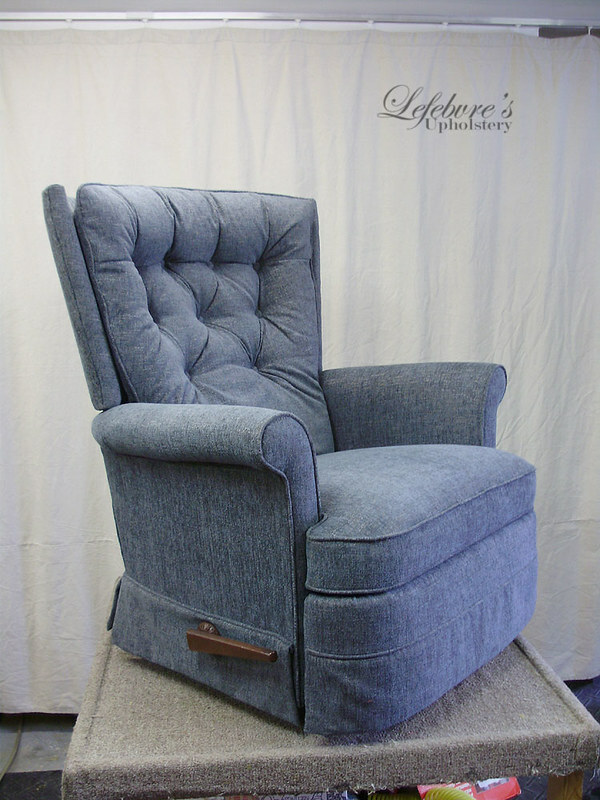 You can get an idea of the overall look, however.